Tostada Salads have always been a favorite Mexican food of mine. There’s just something about that crunchy shell that I adore! 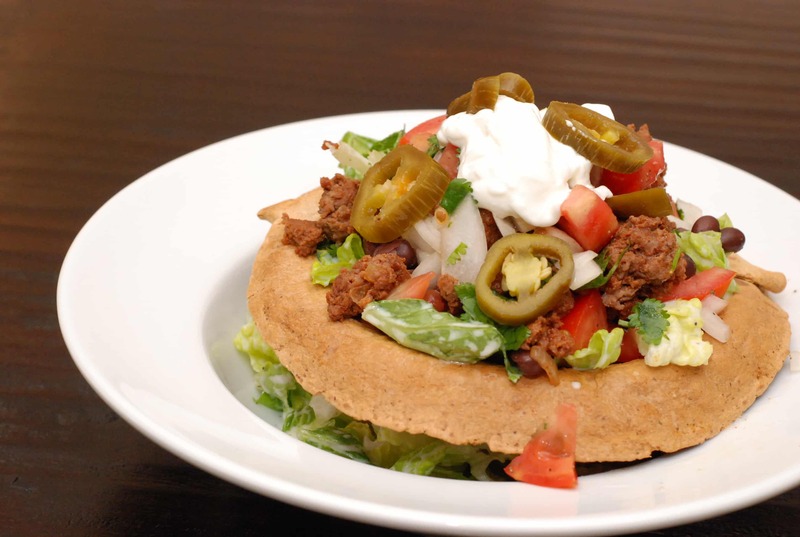 However, in traditional tostada salad recipes, the shell is fried, thus adding tons of fat, calories and weight watchers points. My slimmed down version has just a 7 Points, (for the entire dish) and still offers that yummy, crunchy shell – but baked, not fried. Plus, it’s loaded with fiber! And the best part, is that is still has all the delicious flavors of the ground beef tostada salad that you would buy from your favorite Mexican restaurant. Though this is not an official one of Weight Watchers Salad Recipes, it’s a fabulous meal idea for any one who wants a low calorie Mexican recipe! Preheat oven to 400 degrees. To make your tostada shell, use a small, round, oven safe baking bowl or tin. Lightly spray with non-fat cooking spray and place your tortilla over the tin. Lightly spray the tortilla with the non fat cooking spray, and place an oven safe bowl over the tortilla and the baking tin. It should be covered just enough so that the bottom edges of the tortilla are exposed. Bake in the oven for 10 minutes, which should be just enough time to get the tortilla to mold to the baking tin. Now remove the oven safe bowl, and place the tortillas back in the oven for approximately 10 more minutes, or until the shell is hard, but not burned. Remove shell from oven, and take off of the baking tin and set aside. In a medium sized frying pan, brown your ground beef and mix in the taco seasoning and black beans. Now fill your tostada shell with the lettuce and top with the ground beef. Next, add on your pico de gallo, sour cream and jalapeno slice. If you add 1 oz of low fat shredded cheddar how many pts would it add? 3? Also, how do you figure pts for guacamole? Would using ground turkey reduce the points for these? They sound yummy! It may…but barely. Possibly not even a whole Point. Extra lean ground beef has about 140 calories for 4oz, and ground turkey has about 120. So, we aren't talking about a huge difference here. But hey, every calorie counts, so if you prefer the ground turkey…go for it! I make flat tostadas all the time, what a great idea to shape them! :) I will try that soon! Thank you!